Marvel Fans! Nathan Fillion is… ? Marvel movie fans, here’s some great news. We all just got some casting news that (if you’re not) you should be very excited for. 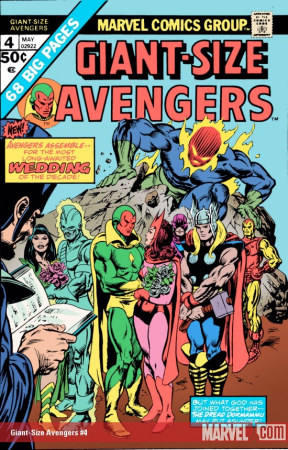 Anyone following me knows that I am madly in love with the Vision and Scarlet Witch series from the 80s/90s. 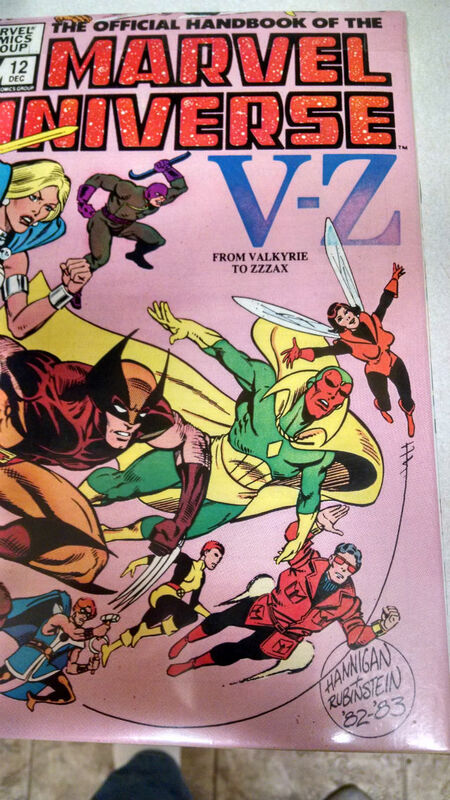 So, it sounds like we’re going deeper into the history of the Vision and the Scarlet Witch. Hopefully, this all leads to the sitcom (on ABC) that this dysfunctional family deserves. In the meantime, I’m hoping they find Nathan Fillion some sweet, ruby-colored shades like these. 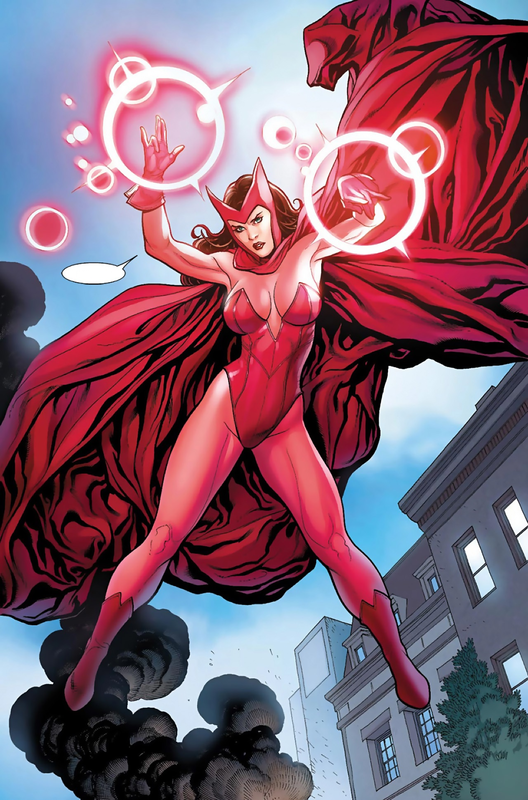 Casual Comics Character Primer – Avengers 2: Who is the Scarlet Witch? Let’s take a look at the “better half” of my favorite Marvel couple – The Scarlet Witch. Curse you, Marvel! 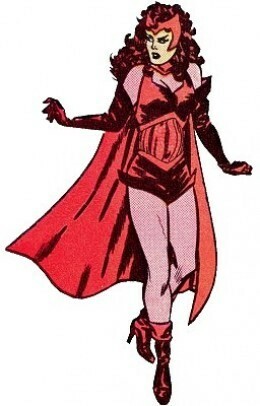 According to their guide, it’s just “Scarlet Witch”, no “The”. I had the same problem with her hubby, Vision. In the upcoming movie, Avengers 2: Age of Ultron, Marvel will finally be bringing my favorite mutant to the big screen. For those of you who may not know who she is, you’re in luck. I’m about to lay some information on you. And I think most of it is accurate. 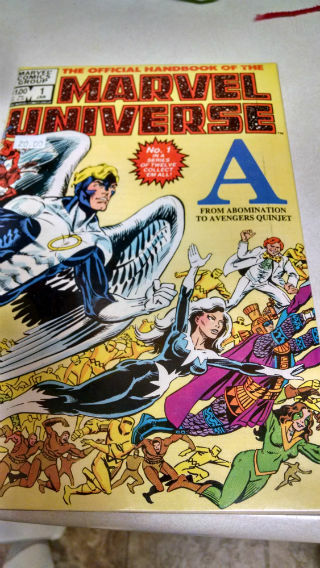 Where necessary, I’ll consult The Official Handbook of the Marvel Universe because, as far I’m concerned, Marvel continuity ended in 1983. Origin: Wanda, and her brother Pietro (aka Quicksilver) are the children of Magneto. However, because Fox still owns the rights to X-Men, you won’t see that in the movie. There will probably be an inside joke or two you might get, though, now that you know that. Holiday dinners got awkward in a hurry. 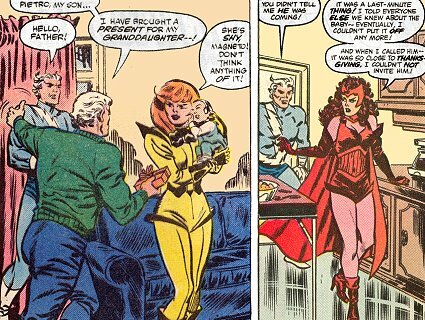 Wanda’s mother was afraid of Magneto after she found out he was a was a mutant with villainous tendencies – understandable, really. 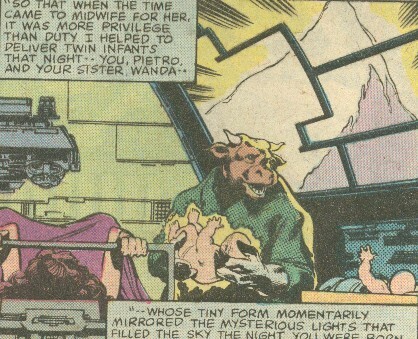 So, before she delivered the babies, she ran away to Mount Wundagore where (and this is going to sound silly) she met a half-woman, half-cow creature named Bova. After delivering the twins, she ran away (presumably to die in the freezing cold) and left them to be raised by the cow-woman. Her “World’s Worst Twins’ Mom” title would later be assumed by Princess Amidala. 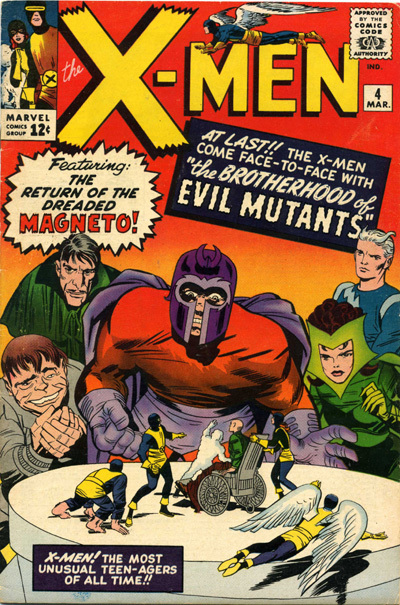 Fast forward through terrible gypsy step-parents, and The Scarlet Witch and Quicksilver became villains, working for Magneto – and none of the three even knew they were related. And for some reason, her costume was green – even though she’s the Scarlet Witch. 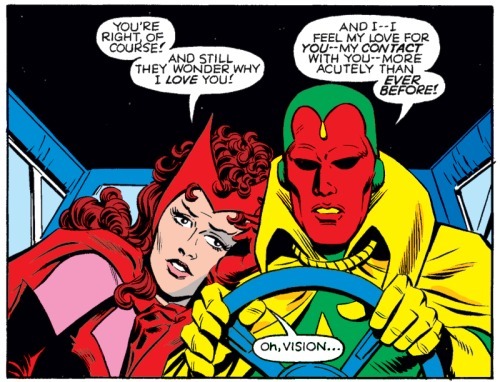 Later, she switched allegiances and joined the Avengers – which is where she met her main squeeze, Vision. 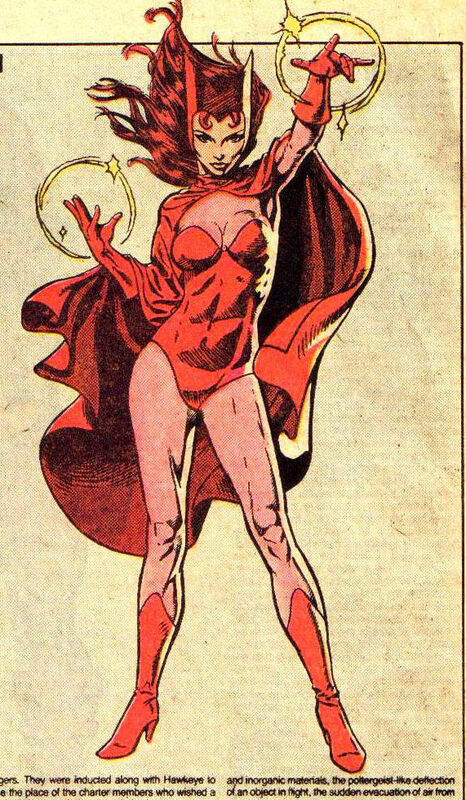 Powers: The Scarlet Witch has three main powers (listed from least to most impressive). 1. She knows real magic. After joining the Avengers, she trained with Agatha Harkness (an honest-to-goodness witch), so she does have mystical powers. I’m also including her hex bolts here, which are just basically a “magic missile” spell. 2. She can alter probabilities. Her mutant powers allow her to make things that are highly improbable happen, simply by changing probabilities. It might sound lame, but it’s super-powerful. For instance, it’s really improbable that a steel door would rust and crumble in seconds instead of centuries, but she’s made that happen. If you’re looking for The Scarlet Witch, you’re looking for a woman with long, curly, red hair and an upside-down “W” on her head. Also, she’s likely to be wearing sheer red stockings and an outfit cut up and over her hips. Unofficially known as the “Scarlet Mommy” costume. She’s probably also casting hex fields in-between going on a rampage when someone hints that her synthozoid husband is not a “person”. Examining her and Vision separately is not as easy as dissecting them as a couple, but their combined family tree is mind-blowing in its complexity. Be on the lookout for Elisabeth Olsen as The Scarlet Witch in the upcoming Avengers 2: Age of Ultron. The tease at the end of Captain America: The Winter Soldier promises a great onscreen version of Wanda. Looks like they’re going for the classic MST3K “creepy girl”, which is perfect. 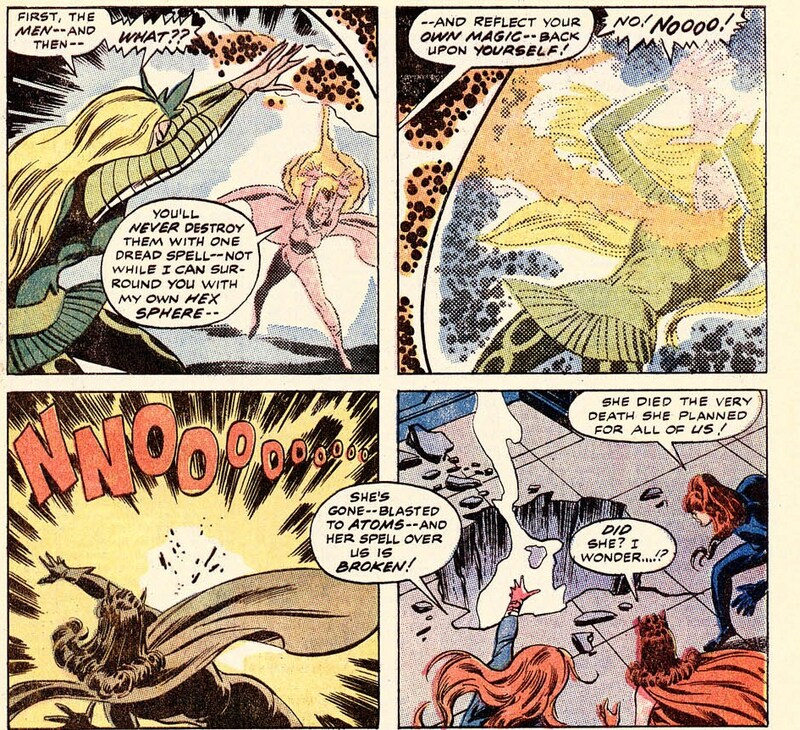 With the new revelation that the Hulk / Iron Man throwdown in Avengers 2 is because Wanda’s hex powers cause Hulk to get out of control, I’m even more excited for her introduction into the Marvel Cinematic Universe. 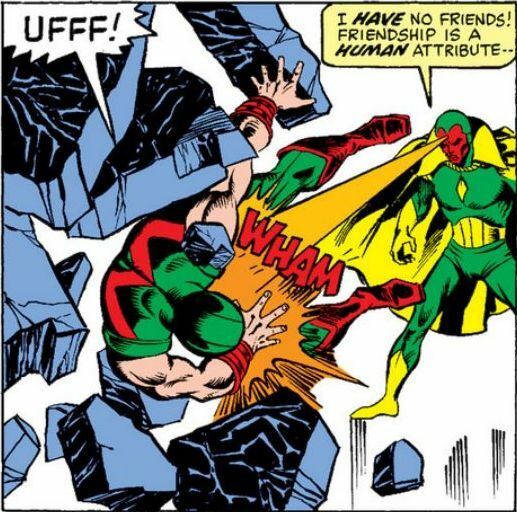 Casual Comics Primer – Who is the Vision? For those casual comic fans out there, I thought I’d start a series of posts with the basics on some characters that are about to get a lot more exposure. With the explosion of Marvel in the media, there have got to be a few people wondering, “who the heck is Iron Fist and why is he getting a Netflix series?” If that’s you… sorry, you’ll have to wait for a future post. Because I’m starting with one half of my favorite comics couple in history. The Vision. 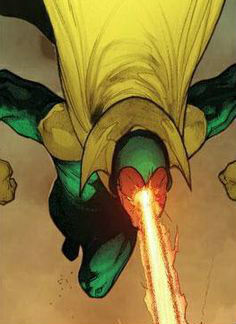 Ever since they announced that The Vision will be in Avengers 2: Age of Ultron, I’ve been super-pumped. And, I’ve been planning to explain why for a while now. I’ve been awaiting my muse on this post for months. Now, thanks to Capital Comics in Reynoldsburg, Ohio, inspiration has struck. Over the holidays, I bought the definitive tome on all these characters. I’m speaking, of course, of The Official Handbook of the Marvel Universe. At half price, the 12-issue series only cost me $10. And, as you can see, my favorite synthozoid is even on the cover of issue #12. So, let’s start there. I’m about to crack the seal on this set and we’ll take a trip down memory lane, rediscovering these characters again through the lens of the official Marvel canon, as published in 1983 by the mighty House of Ideas. 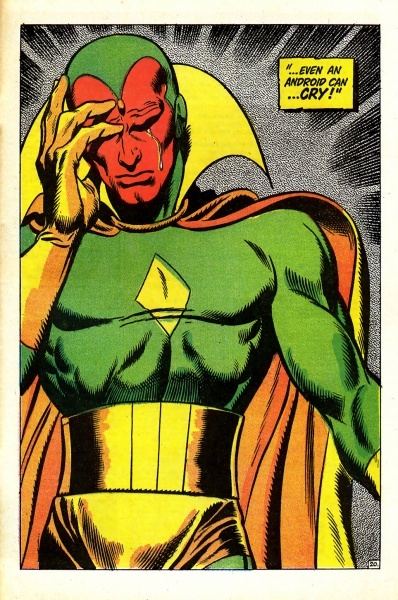 Since he appears on the cover of #12, let’s go ahead and start with The Vision. Well – first off, let me apologize to my main man. According to the title of his section, he’s not “The Vision”, he’s simply “Vision”. Perhaps Mister Vision, if you’re nasty. So, not “The Vision”. Sorry again, pal. I wasn’t aware that was an option when I picked a major, but I wish I had known. Apparently synthozoid rights hadn’t been hammered out in 1983. If I recall it correctly, the government deactivated Vision and/or held him prisoner at some point. I hope they decided on his civil rights at that time. But when was the first appearance of Jim Hammond. Dang you, Marvel. I know I can probably look it up on the internet, but what were readers in 1983 supposed to do? OK – I just looked it up. Apparently, Jim Hammond was the original Human Torch’s secret identity. But, I think he was a robot, too. I don’t know what’s going on here. All casual fans can feel free to disregard Jim Hammond – it’s only going to make your head hurt. This is how the Jim Hammond investigation made me feel. With that out of the way, let me fill you in on Vision. He’s easily identifiable because of these unique characteristics. If you’re looking at a guy with a red face, a green head, and a yellow corset, chances are you’ve found Vision. Also, he cries a lot more than a robot should. He’s got a fully synthetic body. What’s leaking from his eyes? He also has a diamond on his head that we’ll discuss in a second when we talk about his powers. And, don’t forget the black and soulless eyes that some artists put sparklies in. Is Vision a robot or a human? Well, he’s a synthozoid. 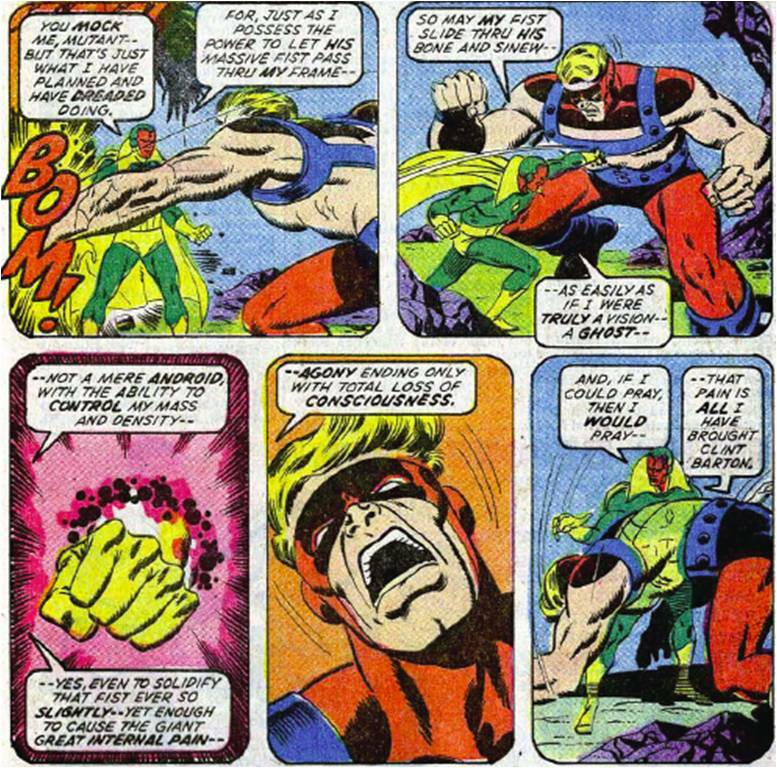 In one of the Vision and Scarlet Witch mini-series, he is described as having a human mind in a fully synthetic body – including the brain. But he’s gone back and forth between being more robotic vs. fully human. It’s important to know where he’s at on the human/robot spectrum. Mainly because the robot Vision is way more likely to go on a rampage, get taken over by other evil A.I.s, or become a massive destructive jerk for a wide variety of reasons. There’s one key to knowing whether he’s more human or robot at any given time. Look at the speech bubbles. They are drawn blockier when he’s more of a robot. They’re drawn normally when he’s more of a human. Human Vision… driving a station wagon for some reason. Just remember the saying (that I just made up)…Round and white, he’s alright. Square and yellow means a robot fellow. The main one is that he can alter his body’s density. When he’s less dense, he can fly and walk through walls. When he’s more dense, he can absorb huge blows and deal massive damage. The one unique thing you’ll see from Vision is that he can make his limbs less dense, phase them into another being, and become slightly more dense, causing massive amount of pain. Sure looks like it hurts. Through his head diamond, he can also shoot solar beams at his enemies. He also has eye lasers, but that seems pretty repetitive with the solar head beam. Lastly, he’s married to the Scarlet Witch. 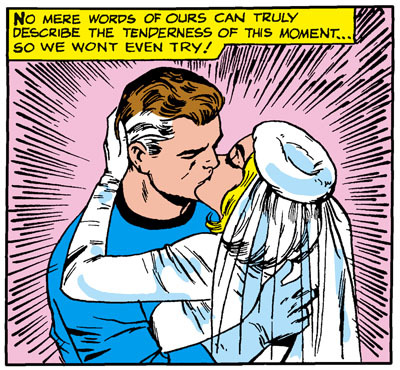 That may not be a “super power”, but if a synthozoid can convince Wanda to marry him, it’s still notable. The rest of the team seems pretty impressed with this power. So, in a nutshell, that’s Vision. If you want to know more about him, you should check out the Vision and Scarlet Witch mini-series. I’ll be back soon with another primer – this time for The Scarlet Witch. (I sure hope it’s “The Scarlet Witch” and not just “Scarlet Witch”). Until then, here’s wishing you peace, love, and great comics. So, it’s not a comic book. 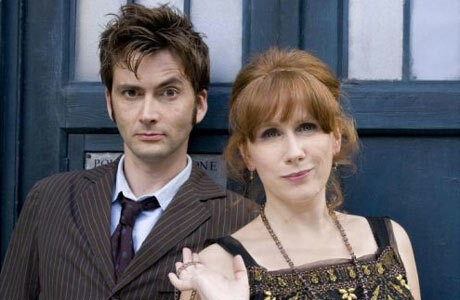 It’s my blog and I’ll put up photos of Doctor Who if I feel like it. I’ve showered a heap of love on one particular comic book couple since I started casually commenting on comics. In the week leading up to Valentine’s Day, I spent a bit of time (OK, way too much time) thinking about my favorite comic book duos. As always, additional comments or suggestions are welcome. I’m looking almost exclusively at guy/girl duos in comic books. Like I said, Valentine’s Day got me thinking about the topic. Whichever way the wind blows for you, it’s all good. That’s just my frame of reference. I’m thinking mostly of duos that functioned as a self-contained team, or at least teamed up regularly enough that they’re linked in my mind. Romance not required, but the possibility of romance certainly helped some duos jump up in the rankings. In my youth, these two were the “first couple” of the Marvel Universe. Way to dress up for the occasion, Reed.